When you operate a business, it is important to keep track of the retail inventory. Business owners need to know what retail inventory is stock, and what retail inventory is needed. In addition, Business owners need to track stock reorder level, reorder time, quantity of inventory that is needed to be reordered, and whether items have been discontinued. 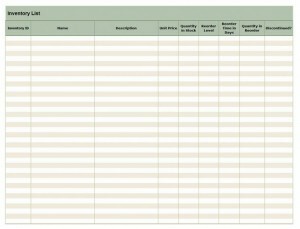 The Retail Inventory Checklist template takes business owners step by step and is easy to use. This Retail Inventory Checklist Microsoft Word Template is downloadable for free on this page and it produces a personalized finished product that will easily address the inventory needs of business owners. First, insert the Inventory ID that is associated with the item. The inventory ID is usually a numerical number that is assigned by the distributor of the product in order to identify the exact inventory item that is needed. By clicking the drop down menu, you can sort the list according to the ID number. Second, complete the name field that will tell both the business owner and the distributor what the item is called or referred to by name. the drop down menu can be used to sort the list according to the name of the item. Third, fill in the complete description details that paints a picture of what the item. The description will help with explaining the use of the item, or provide the details that will differentiate that item from other items on the list that may be similar. Fourth, input the unit price of the item. The unit price is the amount that it costs to purchase the item from the distributor. The list can be sorted by price by clicking on the drop down menu and selecting the criteria you wish to use to organize the list. Fifth, calculate the number of items that are currently in stock. Make sure to update the list regularly to make sure the list is accurate and prevent running out of inventory or ordering too much inventory. Seventh, indicate the number of days required to have the reorder delivered in the Reorder Time in Days field. Eighth, insert the number of items that are packaged within the reorder. Some items can be reordered individually, other items may only be order in groups, so keeping track of how much comes in each package is essential to keeping track of what inventory comes in at one time. Ninth, indicate whether the item can be reordered freely, or if the item has been discontinued for production by the distributor or manufacturer in the Discontinued field. The drop down menu can be used to sort the Retail Inventory Checklist according to its availability. Lastly, repeat the above steps for each item that is needed in the business’s inventory. First, include as much information as possible in the Retail Inventory Checklist. Leaving field blank can cause questions and doubts to arise later and may cause business owners become frustrated when a piece of information is needed but cannot be determined accurately by using the list. Second, double check the accuracy of the Retail Inventory Checklist. That not only means the information that is inserted into the template is correct initially, but it also means the list must remain current and constantly updated to reflect the inventory levels and use the list effectively.